When BP's oil rig, the Deepwater Horizon, exploded in the Gulf of Mexico on April 20, 2010, 11 of the 126 workers on board were killed. Since then, the most recent estimate is that up to 60,000 barrels (or 2.5 million gallons) of oil per day have been released into the gulf. To put that into some perspective, the 1989 Exxon Valdez disaster dumped some 270,000 barrels of crude oil onto the Alaskan coast. While the full ecological cost of the Gulf spill is yet to be accounted, it is bound to be significant. The immediate impact of the Valdez spill was the death of hundreds of thousands of animals—as many as 250,000 seabirds alone—and twenty years later the effects have continued in the form of stunted growth and significantly higher death rates among marine species in a wide area around the spill site. With about 25% of US wetlands located in the Mississippi Delta, ecologically sensitive sea grass beds along the Florida coast, and the spawning grounds of such species as the Atlantic Bluefin Tuna throughout the Gulf, the effects will likely be exponentially worse. And it's not just a matter of dealing with "mistakes" in oil extraction and production. As bad as spills such as the one in the Gulf of Mexico is, the long-term impacts of burning of fossil fuels such as oil are far worse. Global warming as a result of carbon dioxide emissions from the use of fossil fuels is leading the planet towards environmental catastrophe that threatens both the collapse of human civilization and the mass extinction of huge numbers of species. Into this context comes John Bellamy Foster's timely book. 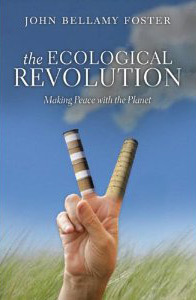 Essentially a collection of his Monthly Review articles (with a few others thrown in for good measure), Ecological Revolution is nonetheless an engaging account of problems facing the planet and an argument for the right—and wrong—way to go about fixing them. Foster starts by defining the problem, then moves on to a Marxist analysis of the crisis, along with an accounting of the role played by revolutionary socialists founding and pushing forward the environmental movement, before concluding with a call for revolutionary socialist change of society as the only real solution. In his survey of the crisis, Foster uses the latest scientific analysis to give a clear—and downright scary—picture of the catastrophic global climate change. He points out, for example, that based on the historical record, a 1° C increase in global temperatures could mean an increase in sea levels of up to sixteen feet, while an increase of 2.8º C could lead to sea levels eighty feet higher than now. Furthermore, even the most optimistic assessments leave very little time for society to do anything about it. He points, for example, to tipping points such as the loss of the Arctic ice cap. If and when it does melt, in addition to adding to rising sea levels, its loss would further accelerate global warming due to the sunlight it now reflects back to space being absorbed by the earth instead. This could happen any time within the next twenty years. So what is being done about it? Foster lays bare the twisted logic fundamental to the establishment opinions in the debate surrounding the issue. He argues that their responses are merely the extension of economic business-as-usual at the expense of the planet and its people. Foster illustrates this through an explanation of the Stern Review, which he refers to "the most far-reaching establishment attempt to date" to analyze and provide solutions to the global warming problem. The report calls for a decrease in emissions of CO2 and other greenhouse gasses in order to stabilize them in the atmosphere at 550 parts per million and, in turn, keep global average temperatures from rising more than 3° C over pre-industrial levels. Such levels, as the report itself points out, still only bring a 50:50 shot at preventing warming in excess of 3° C.
3° C over industrial levels have not existed on earth for about 3 million years, and might be enough to reduce the water flow in the Indus river by 90%, as well as shut down the Gulf Stream, paradoxically bringing “Siberia-like conditions” to Europe. Stabilizing CO2 at lower levels would, of course, prevent any problems from occurring, but the Stern Review rejects that as an option because the costs of doing so "are unlikely to be economically viable." In other words, profits take priority over people and the planet. All of which makes obvious the need for fundamental change to the economic system. In the other chapters, Foster provides several key examples of how a socialist approach is the key to this change. He traces the origins of the ecological movement in the US through an analysis of Rachel Carson's Silent Spring, the origins of the idea of ecology itself in the work of pioneering Soviet scientists in the decade after the Russian Revolution, and the origins of a Marxist approach to the environment in the writings of Marx and Engels on the 19th Century agricultural crisis. Where Foster's analysis is less than compelling, however, is in his insistence that places such as Cuba and Venezuela are leading the way in reversing ecological problems through genuine revolutionary change. The best example for this that he can provide is that of urban agriculture in Havana. While it is an impressive example for other urban centres around the world, it is far more the case of "a forced response" to the loss of Soviet aid than anything "deeply rooted in the Cuban revolution," Foster's insistence to the contrary notwithstanding. His other examples, such as Venezuela's use of oil profits to fund social programs, are considerably weaker. Even here, though, Foster does manage to find his way towards a clear analysis of the situation, albeit in the context of the Soviet Union under Stalin. In discussing the change from the dynamic work on ecology by Soviet scientists and other thinkers in the 1920s to the "ecocidal" Soviet policies of the 1930s on, Foster argues that Marx's ecological critique of capitalism was discarded "as the expansion of production at virtually any cost became the overriding goal of the Communist movement." The same could easily be said of Chávez's oil-based regime, whatever the gains that have been made by workers there.